I was born into a fantasy world. Father was in charge of writing, editing and publishing comic books for Walt Disney Studios. Fairy dust flew rampantly through our house a short block from the Disney Studio. Wherever my imagination took me, I’d hang on for the ride. I ate ice cream for breakfast and believed trees could talk. What I couldn’t foresee was the unexpected foe waiting to strike. My life was fated as Sleeping Beauty was fated. My quest was how do I deal with fate? Charm it, resist it, ignore it, accept it? Do I keep quiet or expose it to the masses? I was a young girl born in the 1950s and believed I was a long lost princess just left on the wrong doorstep. I was secretly waiting for Prince Charming to claim me. The only foil in this scenario was that my three brothers told me time and time again I was no princess. When I was seven, Father started inviting me to come to work with him to help screen comic book story submissions. I would be given a pillow on the floor and a large stack of typed manuscripts containing potential comic book stories to read. These were typed on flimsy onion-skin paper that I had to be careful not to smear or tear. They were all dialogue with some visual descriptions, similar to how a play script reads. I had to imagine Donald and his nephews on these adventures since the story had not yet been illustrated. I wonder how many of those script writers knew their story’s fate (and pay check) was partially being decided by a seven year old? The scripts I liked best were placed at the top of Father’s pile that he’d read later but they’d already been judged by me, the audience for whom they were intended. My grandfather Ransom was a radio personality. 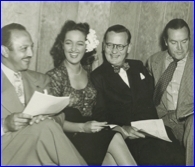 He is pictured with Mel Blanc, Dorothy Lamour, Ransom Sherman, and Bob Hope. They are about to tape G.I. Journal #49, June 1944. G.I Journal was a weekly show recorded by the AFRS network for the American soldiers fighting overseas in World War II. 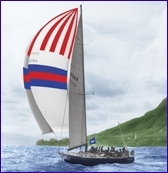 Nick Frazee on his boat Swiftsure entering Honolulu after the 1975 TransPac Race. You’ll need to read the book to get the whole story.